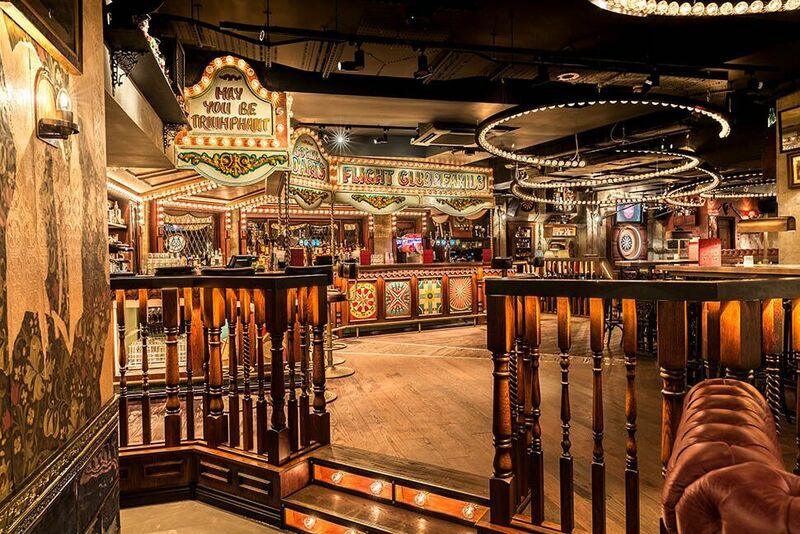 A carousel themed dart bar in London’s West End, Flight Club Bloomsbury is a truly unique event venue for private parties and corporate team building sessions. Centrally located just steps from Tottenham Court Road, the bar is easy to reach from every part of London. As well as offering the ultimate social darts experience, Flight Club Bloomsbury serves mouth-watering pizzas and cocktails – what’s not to love? The whole venue is able to accommodate up to 250 seated guests and 400 standing. Organising a smaller event? A private room called The Enclosure is waiting for you. With 3 oches to show off your darts skills, it’s suitable for groups up to 50 people. To top it all off, it’s attractively affordable, too – package prices start from as little as £35 per person! Flight Club Bloomsbury is the little sister to Flight Club Shoreditch, which since opening in October 2015 over 150,000 people have tried their hand, 14 million darts have been thrown, and they’ve been awarded the Most Loved Bar in Shoreditch and Hoxton in the Time Out Love London Awards 2016 and Best New Venue in London in the Design My Night Awards 2016. 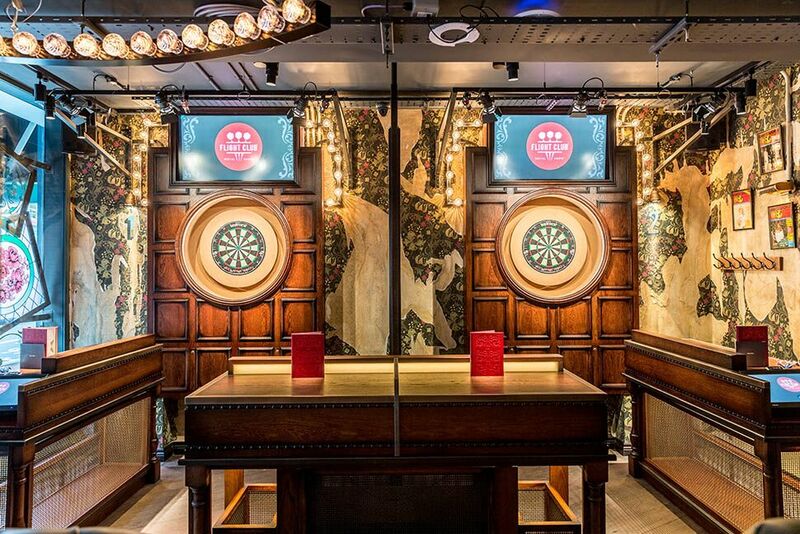 In Spring 2017 the Social Darts phenomenon spread as they opened their second venue Flight Club Bloomsbury at 55 New Oxford Street, offering the same great experience, with this bar’s décor building on the Victoriana and fairground themes found in their first venue and turns them up to eleven. 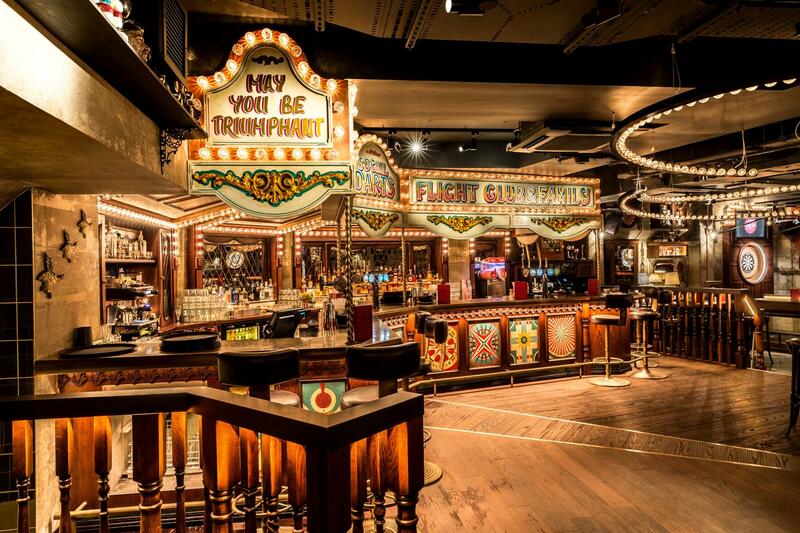 A large, ornate carousel themed bar takes centre stage, serving signature slushy cocktails, craft beers and themed shots. Groups from 6-250 can play, with Flight Club Bloomsbury offering an exclusive private room with 3 oches hosting up to 50 guests. Create your very own Social Darts experience with a private room all to yourselves. With three beautiful oches, tables and a bar just for you, there’s plenty of space to play as well as watch the drama unfold for up to 50 guests. For the ultimate Social Darts experience, you can hire Flight Club exclusively for up to 250 guests seating layout. You’ll have 9 oches, 2 bars and innovative gameplay technology ready to give your guests an event they won’t forget! Hire The Basement and make the most of six oches, multiple seating areas and enjoy our beautiful carousel bar all to yourself. With space to show off your Social Darts skills as well as enjoy our delicious selection of food and drinks, it’s the perfect space to create a truly unique event for groups of up to 200 people.